This classic Alpine run offers 5 challenging distances in some of the most spectacular country in Victoria’s Alpine National Park. The 68km Mt Feathertop Skyrun, the 64km Razorback Ridge run which builds on the 58km course but takes in the entire length of the Razorback to offer some of the most spectacular running and scenery in the Australian Alps and the short course Razorback Ridge – a delightful day out up to the Summit of Mt Feathertop and back along the Razorback. Set in the heart of Victoria’s high country the Razorback Run is one of the most amazing high altitude runs that Australia has to offer. Razorback Ridge/ High Plains Run 64km of pure Alpine pleasure and pain with stunning scenery – or possibly lots of mist and no views at all. This is the most stunning and spectacular run of its kind in Victoria and the culmination of over 8 years route planning – a must for the hardened runner. Mt Feathertop Skyrun 58km – the ideal training run for anyone thinking of attempting the Alpine Challenge 100mile ultra as it covers 3 of the six climbs and descents. Harrietville Hash 40km, a great run up Bungalow Spur, across the Razorback & down Bon Accord Spur. Razorback Ridge 22km, an out and back run across the Razorback to Mt Feathertop from Diamintina Hut. Experience the thrill of running to the summit of Mt Feathertop, Victoria’s second highest peak and Australia’s only real mountain and enjoy stunning views of the high country from the summit, the high plains Swindlers Spur and the Razorback – weather permitting. 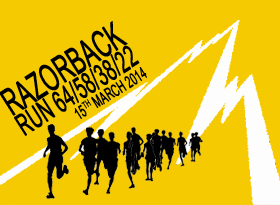 The Razorback Run is a totally self supported run, it is not a race. Runners are fully responsible for their own safety and assume full liability for their participation. Participants should offer assistance to other runners in distress and must give way to walkers, especially on the Razorback track. No support personnel or equipment is available other than start / finish at Harrietville Caravan Park unless runners bring their own support crew. The 68, 64 and 58km runs cover an arduous course with 3 major climbs that take a cumulative toll. Water is available from rivers and a spring along the course. Runners will be responsible for recording their own times and a run register will be located at race Headquarters at the Harrietville Caravan Park. Runners must log in as a safety check. The run takes place in an exposed Alpine environment that can be subject to sudden and severe changes in weather. Rain, fog, high winds, sleet and snow as well as hot sunny days can occur during December. Do not take this run lightly, runners have died in this region. Hypothermia is a serious risk and all runners should be prepared for any weather conditions. The Razorback Runs should only be attempted by experienced trail runners with good navigation experience. As a minimum, runners attempting the course must have successfully completed at least one 30 km organised trail run in the previous 6 months.